Populous, the original "god game," is a true gaming classic. Designed by Mr. Peter Molyneux (who, reminder, will be joining us on Spke TV to provide analysis during E3), it was simple and to the point—you've got a civilization of people. Sheperd them as you will. Game designer and illustrator Jon Caplin is clearly a big fan of Populous, and has designed a free browser game called Reprisal as a tribute. 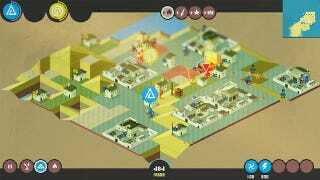 Reprisal is a really neat little thing, totally free to play in your browser. It features a thick, pixel-art style and low-key wit reminiscent of Superbrothers' work on Sword & Sworcery, with some great music by New York musician/hacker Eric Skiff. I was playing this game today and left it on in my browser, and wound up listening to the soundtrack for a good chunk of the afternoon. Good stuff. You can play the game here.